Are you in the mood for an optical illusion that is most certainly going to mess with your sense of perception? Well, I have one for you that definitely messed with me for quite some time. This is an image that is definitely going to play with your brain and sense of perception. Basically,you can perceive this image in two different ways. Therefore, don’t just skim over the image and keep going. 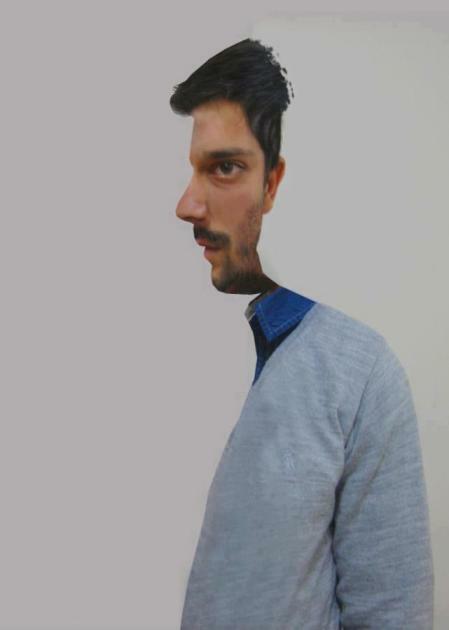 Instead, continue to look at the image and you will definitely see that there are actually two different ways to view the man in the picture. Do you want to see what I’m babbling about? If so, scroll down to check out this amazing half man optical illusion. So, did this picture of the man mess with you like it did to me? As you can see, you can perceive this picture in one of two ways. Either the man is looking directly at your or he is standing sideways in the picture. Either way, this is an amazing optical illusion. Did you enjoy this optical illusion? If so, you should share it with your friends, because I guarantee you that they will enjoy the picture, as well. Also, you can rate this post to let us know what you thought. If you want, you could leave a comment, as well. Either way, we’d love to get your input.